In this particular set of restaurants, there were stalls dishing out Vietnamese food, Filipino, Japanese, Chinese and I think I remember Indian food stuffs. Anyway, it was a perfect place to go when everyone in the lunch group wanted something different. I would always get the Vietnamese Noodle salad. The best part about the salad were the “add ons”. Kind of like Jamba Juice power boosts, you could “power boost” your salad with egg rolls, bbq meats, tofu, etc. I chose fried, of course…Egg Rolls. Since we’re no longer in SF, I make the salad at home and its delicious! Boil water and cook the rice noodles per the instructions on the package. Pull out the noodles and put them into a bowl. 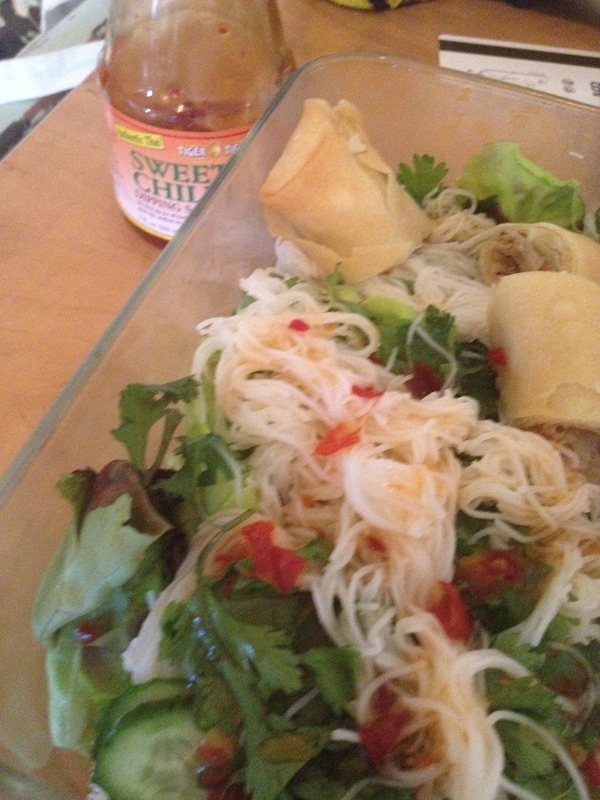 Put the sweet chili sauce into a small bowl and thin with the reserved noodle water. Pour 1/3 of the mixture over the noodles and mix with chopsticks or tongs. Put the dressed noodles into the freezer to cool. Place the lettuce at the bottom of a large bowl. Then the cucumbers. Dress with 1/2 the remaining dressing. Once the noodles are no longer warm, put those on top of the salad. Serve with the accoutrements on the side: basil, mint, cilantro, lime wedges, remaining dressing and egg rolls that have been cut into 2″ pieces. Enjoy with some BBQ pork slices and rice. Scrumptious! Do you ever find yourself with nothing to watch on the DVR so you have to watch LIVE TV. Oh the commercials are just so irritating. Why do they have to be so loud? That’s why I love KQED or any local public stations. I get to escape the commercials and watch Lidia’s Italy. I love that show. It’s so relaxing and inspiring. Watching the show the other day inspired this version of her comfort potatoes. Seriously, bacon and potatoes, marinated artichoke hearts and green beans all fried to deliciousness? How couldn’t I resist? Put the potatoes (whole) into cold water and boil until tender (a fork can easily pierce through it). Pull out the potatoes and slice them into 1/4″ rounds. I pulled some of the skin off. Using the same water, drop the green beans in for a couple minutes but not too long. Remove from water and set aside. In a separate pan, fry the bacon until crispy. Remove and drain on a paper towel. Cook the onion in the bacon fat until tender. Add the potatoes and some salt. Let them cook over med/high heat so they get a bit browned. 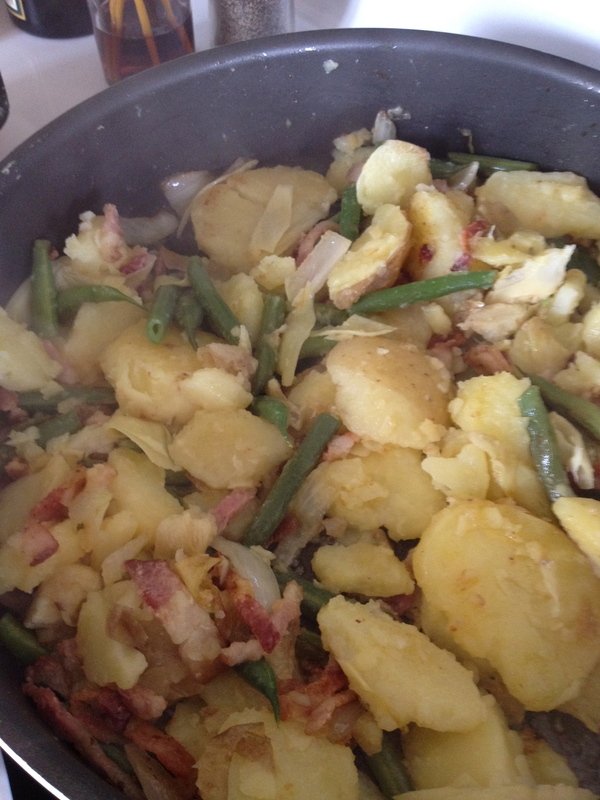 Add back in the bacon, green beans and artichoke hearts. Cover and cook for a couple minutes so everything can get to know each other. Flip over the mixture and cover for another 2 to 3 minutes. Salt and Pepper to taste. Serve with a grilled pork chop and enjoy!